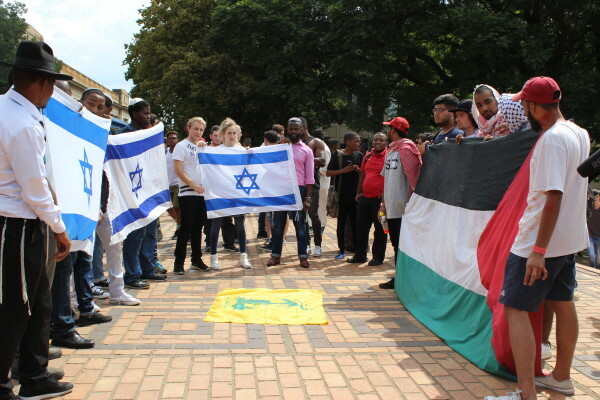 THE WITS Palestine Solidarity Committee (PSC) and the South African Union of Jewish Students (SAUJS) have, this week, shared the Wits piazza outside the Great Hall during Israeli Apartheid Week (IAW) in what can only be described as a hostile-roommate situation. IAW kicked off on Monday with tensions flaring between the PSC and SAUJS over the proximity of their respective stalls. After a physical altercation between members of the respective societies, Wits management decided that SAUJS would relocate their stalls to Amic Deck. The university has deployed private security, seen dressed in red jackets and black pants, on Wits East campus to neutralise the potential of any tensions that may affect the university programme. Chairperson of the Wits PSC Rashad Yusuf Dadoo said being forced to share the same space as the SAUJS “doesn’t create healthy debate or an enabling environment. All it does is promote antagonism between the two and in turn students don’t get to learn about the cause”. After a four-hour deliberation between the university, PSC and SAUJS on Monday afternoon, it was agreed that from Tuesday the opposing societies would share the piazza for the rest of the week, however, on opposite ends. The PSC has argued against the peace claims made by SAUJS, saying that their presence is to create animosity. Furthermore, members of the PSC claim that the university is aiding SAUJS by taking extraordinary measures to accommodate them, perhaps due to pressure from external funders. “If a gay rights organisation is having a demonstration on campus, the university doesn’t go out of its way to accommodate religious organisations who oppose them,” said Dadoo. IAW on Wits campus has a reputation for creating tensions between students who support the state of Israel and those who pledge solidarity with Palestinians. Although the altercations have now become infamous, IAW has also provided a platform to bring awareness about the conflict that has ravaged the Middle East for decades. “We can’t afford, in times of injustices, to not pick a side because not to pick a side is to pick the side of the oppressor,” said the Wits chairperson of the South African Students Congress, (SASCO), Mpendulo Mfeka.